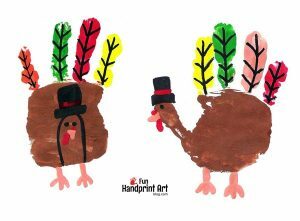 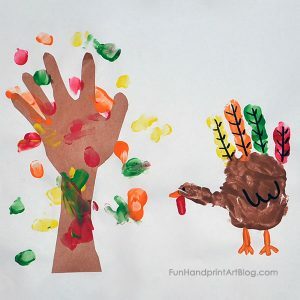 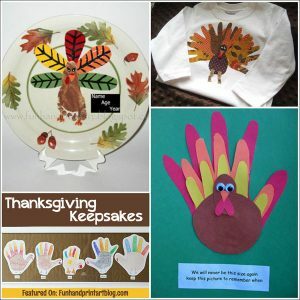 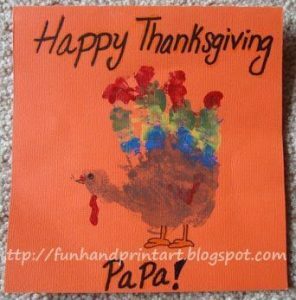 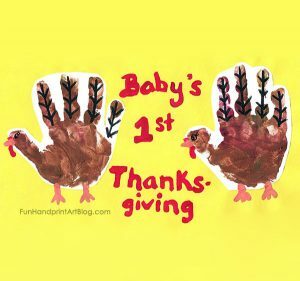 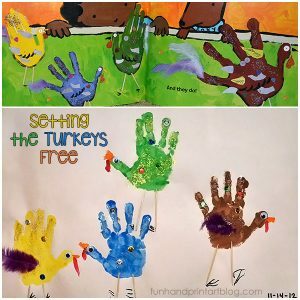 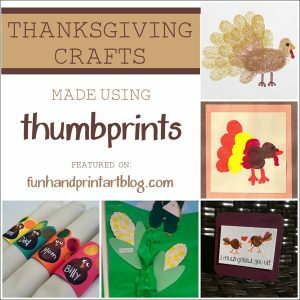 Printable Thanksgiving Fingerprint Art Project – Free template! 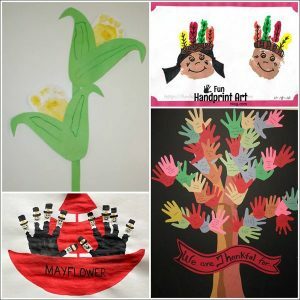 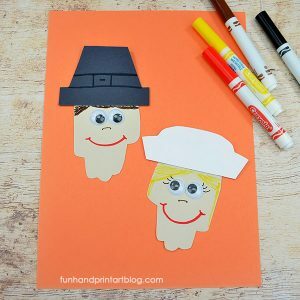 When learning about first Europeans who reach New World after traveling more than 60 days on Mayflower, integrate history with art by using our free background template to create a printable Thanksgiving fingerprint scene with kids. 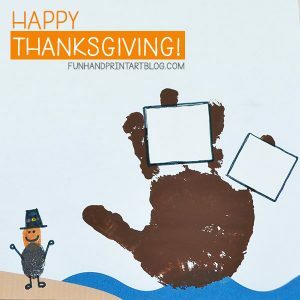 Thanksgiving Background Template – No Writing -or- Thanksgiving Background Template – Happy Thanksgiving! 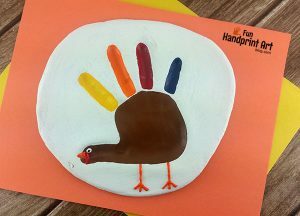 Print the template. 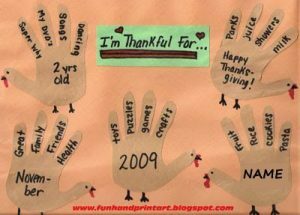 There is one with “Happy Thanksgiving!” written on it and one without. 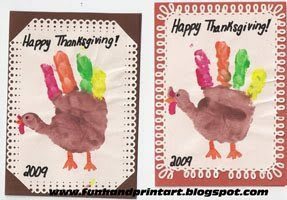 The one with can be colored. 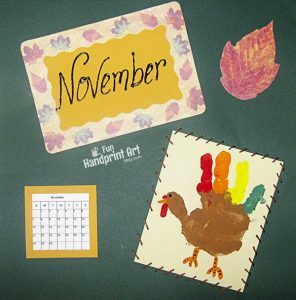 Choose Thanksgiving colored ink pads for the turkey feathers plus black ink for the pilgrim. 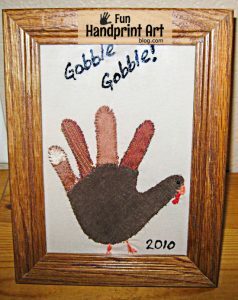 Get a small amount of brown paint and a paintbrush ready. 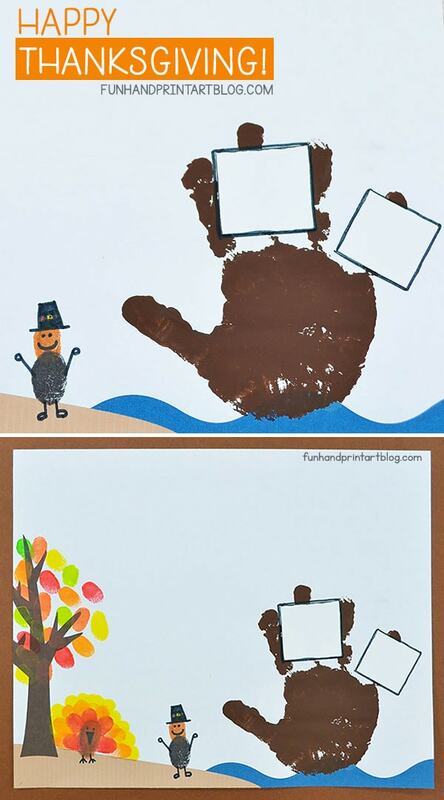 Create a boat by placing a brown handprint in the water, palm towards the bottom and fingers upward. 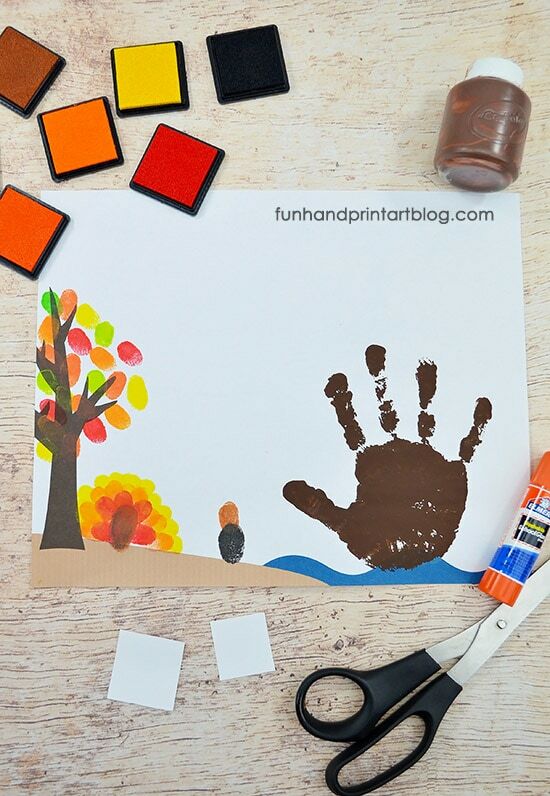 Cut two white squares out of paper and glue them to the fingers of the brown handprint to create sails. 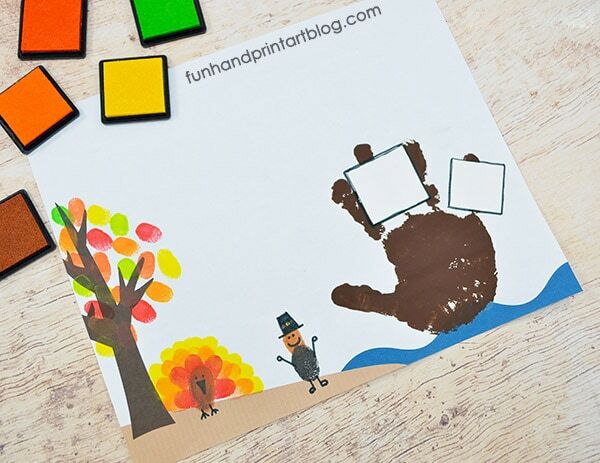 Use black ink to create a large fingerprint or thumbprint for the body with a smaller tan fingerprint placed on top. 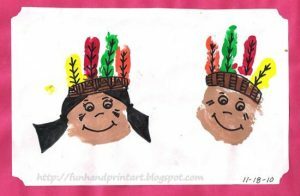 Draw on the traditional black hat plus arms, legs, eyes, and a smile. 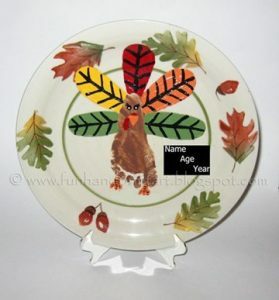 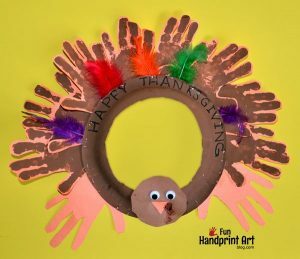 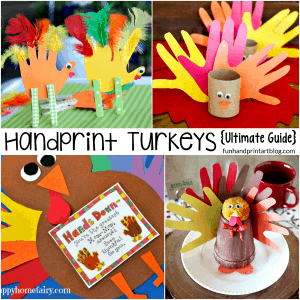 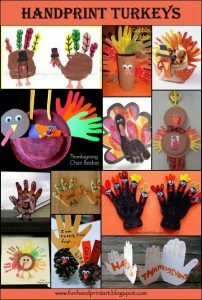 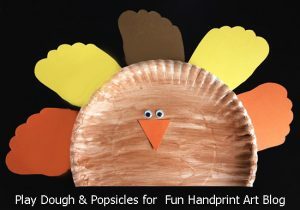 Start creating the turkey feathers by placing five red fingerprints next to each other in a fan shape. 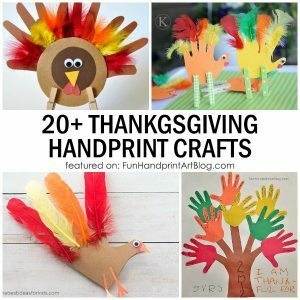 Add seven orange fingerprints above these, also in a fan shape. 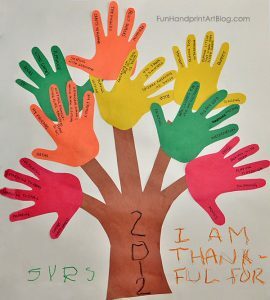 Repeat with yellow fingerprints. 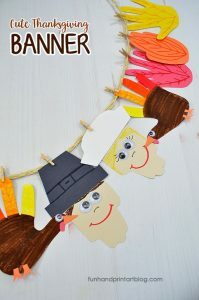 Complete the turkey with adding tiny legs, eyes, and a beak with a wattle. 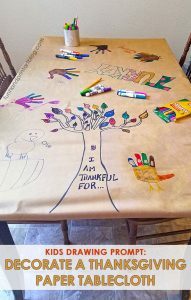 Add autumn leaves to the tree trunk template by placing fingerprints on the branches in green, orange, yellow and red ink. 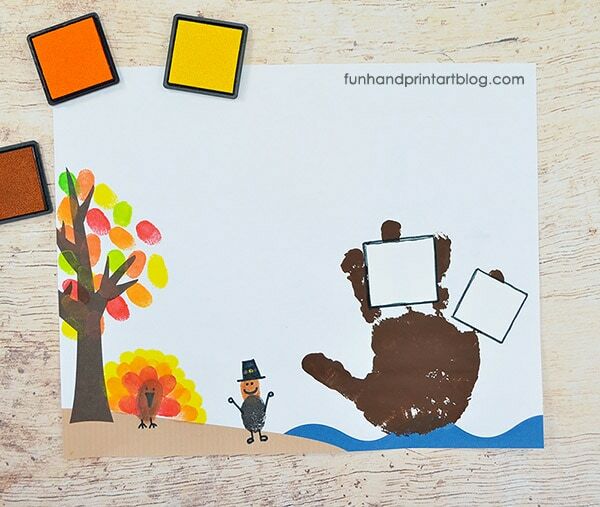 You could also add some falling leaves plus ones on the ground. 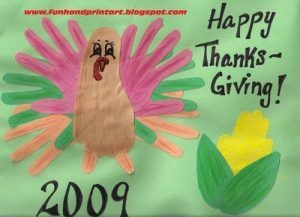 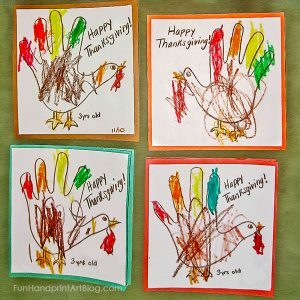 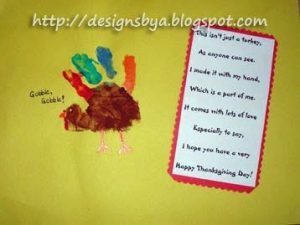 Finish the Thanksgiving fingerprint scene by writing a fun Thanksgiving phrase along the top. 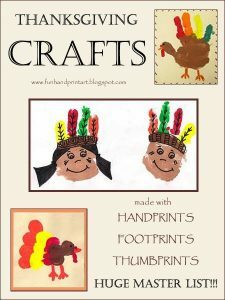 This interactive Thanksgiving guide from Scholastic is a great resource for teaching kids about first settlers and their voyage in New World, as well as their interactions with Native Americans and their way of living. 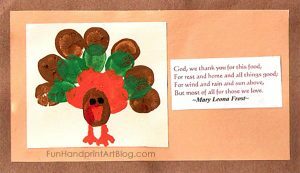 You can find few important facts about Thanksgiving, pilgrims, the Mayflower, turkeys and write the fun facts on along the top or on a separate sheet of paper. 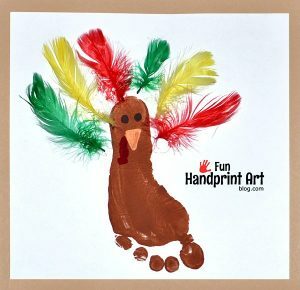 Here a Native American handprint art project you could make along with this printable Thanksgiving fingerprint scene.